From Green Lake to Golden Gardens, Seattle Has a Plethora of Outdoor Riches. You're here to visit the Space Needle, Pike Place Market, and the Fremont Troll. But one of the things you should really be doing is enjoying the sunshine outside. We have a lot of beautiful parks and beaches that are great for leisurely strolls, picnics, or low-level hikes, all within the city limits. 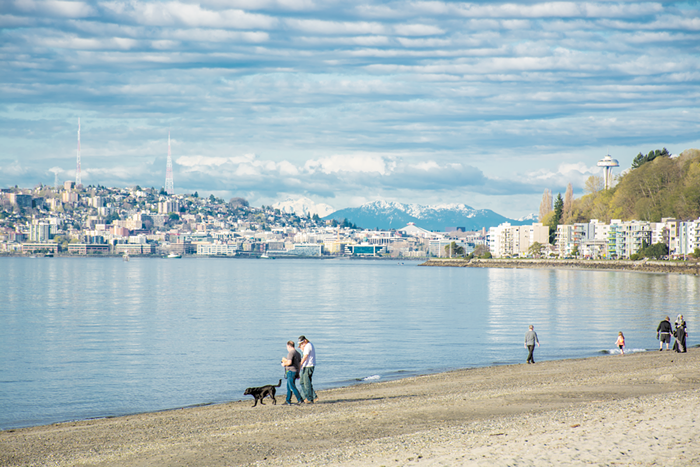 Alki Beach is one two truly beachy beaches in Seattle—it's a bit smaller than Golden Gardens in Ballard, but comes with a totally SoCal boardwalk. Bikers, skateboarders, rollerbladers, and walkers course up and down the crowded sidewalk along the beach. You can take a break and eat ice cream, burgers, pizza, or drink margaritas by the water and people-watch. The sandy area is small, but there are a few fire pits that you can lay claim to if you want to barbecue, and a beautiful view of downtown Seattle and beyond. Worth the 25-minute trek to West Seattle. In this wonderful place, which was formerly a military base, you can see houses that were built for army officers as you walk through Fort Lawton, which gives parts of Discovery Park a Little House on the Prairie feel. Located in the neighborhood of Magnolia, a short car or bus ride from downtown, Discovery Park is the biggest of the city's parks. It has 534 acres, and you can make your hike as challenging as you'd like, with a steep trail through the woods that takes you to the beach below. If you get there, you should walk over to the West Point Lighthouse and sit on the rocky sand. (Cheaters can drive right to the beach and park at the lower level parking lot.) Or you can walk the hilly fields that offer stunning views of Puget Sound. If you squint, it almost looks like you're in Ireland somewhere. Golden Gardens is a true beachy beach with the golden sand of its namesake. You'll see boats swirling around on Puget Sound, people playing volleyball and sitting around fire pits. There might be a drum circle or two, for which we apologize in advance. The west-facing location of Golden Gardens makes for stunning views of summer sunsets. If you want to get a spot to barbecue, you should show up early and stake a claim. Designed by John Olmsted in 1903, Green Lake Park is one of the most visited parks in Seattle. Located about five miles from downtown (take the E-line bus if you are feeling adventurous), Green Lake has a European feel to it. The lake has a generous path that easily accommodates wheels and pedestrians, and it is especially popular on weekends during the summer. There's a place to rent paddle boards, kayaks, and canoes, and ice cream and snacks are available from local businesses. But the main point of this is the leisurely stroll—about 2.8 miles around from beginning to end, which should take about an hour. If you are here visiting, try to go during a weekday when it's less crowded. People in Seattle call city parks like Madison Park "beaches," in part because it's a space next to water where the public goes swimming, and because there's a tiny strip of sand. But it's really a park—a green patch of land next to the water. If you want to see where the young, hip locals hang out for a day in the sun, then go to this part of the Madison Valley neighborhood and relax. Afterward, you can grab a bite and a drink at one of the many nearby restaurants. Volunteer Park is located on the tonier north side of Capitol Hill. The grounds are lush, and on the west-facing side, there's a famous sculpture, Black Sun by Isamu Noguchi (yes, the Soundgarden song is named after it), and, during sunset, the sun will line right up in the center of it. One of the lawns has a stage used for outdoor concerts and theatrical productions, and there's a small, sweet conservatory, where for $4, you can see a range of plants and flowers. A perfect place to picnic. Run by the University of Washington, the Arboretum is a beautiful 230-acre park right in the center of the city. Walk down the great open trail, Azalea Way, all the way to the end at Duck Bay. If you curve to your left, it'll take you to another trail with floating walkways and a marshy swampy area, with lily pads covering the water. Or traverse the higher hills and get a completely different, deeper woods experience. The park is free, but if you decide to visit the Japanese Garden (and you should), it costs $6. During the summer months, it's open till 7 p.m.
Where to Swim in Seattle?